With the holidays just weeks away, one of the first places many people will go to for gifts are online stores and e-commerce websites. But if you ask Charles Benaiah, online stores are doing a bad job of helping consumers find what they want. After all, most people don’t have the time to sift through the hundreds of items housed on an online storefront. Benaiah is the founder and CEO of Watzan, a New York-based startup that curates choices for consumers based on their preferences on certain characteristics of items – for example, a T-shirt’s neckline, the material used to make it, the colour, and so on. He calls this “digital merchandising,” adding that it’s a better of way of displaying products than just recommending item A or B, and then hoping consumers will do the rest of the work themselves. 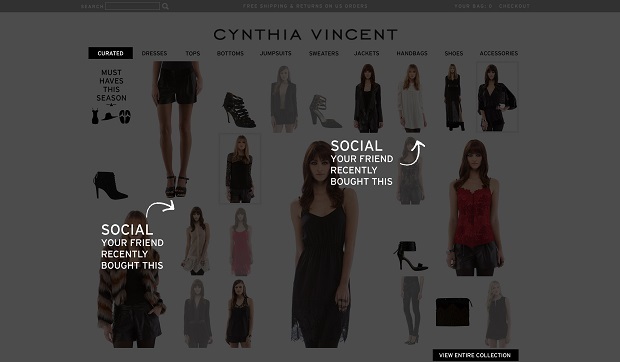 How Watzan will be working with fashion brand Cynthia Vincent. (Image: Watzan). “[Other recommendation engines] tend to show a small number of products – five, six, eight tops. And the reason they do that … is the idea that people can only remember seven things,” Benaiah says. Instead of simply displaying around 10 products, Watzan’s algorithm will pull up 50 items to show a consumer. That sounds overwhelming, but the company highlights the items most likely to appeal to an individual consumer, making those items bigger and brighter than the others around them. It can also add colour, a frame around the image, or any other visual cues to draw consumers’ attention toward specific items. Watzan’s algorithm will also prevent it from displaying the same items over and over. That’s something of a “beef” for Benaiah, as he says he gets annoyed with TV recommendation engines that suggest the same movies multiple times. Watzan wasn’t always focused on the e-commerce space. When Benaiah first started his company, it was more focused on helping TV viewers figure out what shows to watch, based on their preferences. The idea was meant to overturn the current way of finding shows, which involves scrolling through a TV grid listing of channels and times – a “terrible experience,” as Benaiah puts it. It wasn’t until Watzan ran a focus group for users, which included a marketer for fashion brand DKNY, that the company saw the potential in its product for e-commerce. The marketer said she would love to use Watzan’s technology for her online store, given the sheer number of products shoppers typically have to scroll through to find what they want. “I said, you guys advertise. Why would this be good for you? And she backed up for a sec, and she said, think about it. You guys have 500 channels, lousy navigation, and you can’t find something you want to watch,” Benaiah recalls. Now, most of Watzan’s biggest customers are in fashion and e-commerce, with the startup inking a deal with designer Cynthia Vincent this month. Watzan’s work with Cynthia Vincent should go live in January, Benaiah says. The company still provides services for TV, sticking with its original idea of transforming the way viewers search for shows with their cable service provider. However, it’s still in talks with cable companies, and its product isn’t available to consumers as of yet. However, it’s currently working with large pharmaceutical companies like GlaxoSmithKline, Shire, and ViiV to provide apps for their events and conferences. Attendees get access to a display showing the more interesting sessions as bigger and brighter, based on trends and on where their friends are going. No matter where Watzan’s technology is being used, what the company is really trying to do is to help consumers make decisions based on options they’ll actually like, Benaiah says.